Madison Zeiss (left) earned a position in the top 64 on Saturday. Photo Credit: Augusto Bizzi. 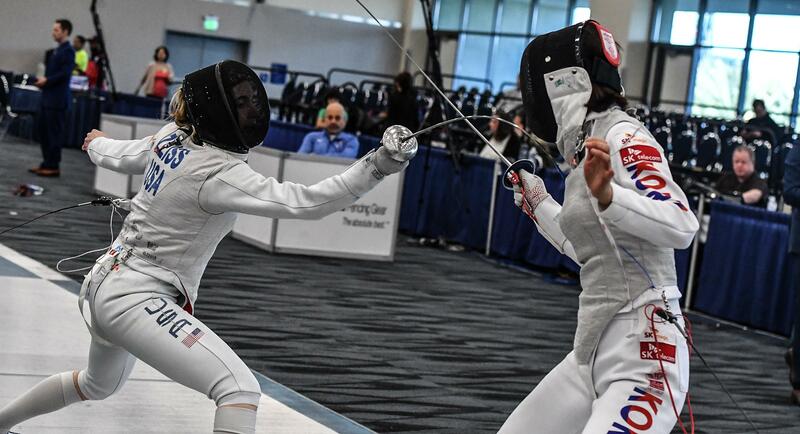 (Anaheim, Calif.) – Team USA will have nine fencers in the table of 64 on Sunday at the Absolute Fencing Gear FIE Grand Prix Anaheim, including four who will be competing in their first table of 64 at a senior international event. Sabrina Massialas (San Francisco, Calif.), Justina Lam (Cherry Hill, N.J.), Zander Rhodes (South Orange, N.J.), Helen Tan (Coppell, Texas), May Tieu (Belle Mead, N.J.), Madison Zeiss (Culver City, Calif.), Rachel Zhang (Winchester, Mass.) all advanced out of the preliminary rounds at the Anaheim Convention Center. They will join 2018 Senior World Team Champions Lee Kiefer (Lexington, Ky.) and Nicole Ross (New York, N.Y.), who were exempt due to their top-16 FIE World Rankings. For Zeiss, Sunday will mark her fourth appearance in the table of 64 this season. Although she had a slow start in pools, going 3-3, Zeiss found her rhythm in the direct elimination table as she cruised past two-time Asian Championship medalist Ha Na Oh (KOR), 15-5, and Eline Rentier (NED), 15-3. A Southern California native fencing approximately an hour from her hometown of Culver City, Zeiss will get to sleep in her own bed tonight and is dealing with both the fun and challenging aspects of fencing on home turf. Massialas is also fencing in her home state. In just her second international tournament this season and her third since 2017 due to injuries, Massialas started the event strong, going 5-1 in pools. In a pool that included teammate Morgan Partridge (Swansea, Mass. ), Massialas’ sole loss came to Julia Walczyk (POL), who ranks in the top 20 in the world rankings. With a bye into the preliminary table of 64, Massialas needed just one win to advance, and she got it with a quick 15-6 victory over Yanan Shi (CHN). Also conceding just one pool loss was Tieu, who went 4-1. With a dominant 15-4 effort over Alely Hernandez (MEX) in the preliminary table of 64, the 2018 Cadet World silver medalist has now advanced to the 64 at every senior international event she’s competed at this season. Tan, Rhodes, Zhang and Lam each made her first table of 64 at a senior international event. Just her third event on the senior circuit, 2019 Junior Pan American Championship silver medalist Tan went 3-3 in pools before edging out Kristina Petrova (UKR), 15-13, and Maeva Rancurel (FRA), 15-7. Her third straight year competing at this event, Zhang also went 3-3 in pools and reached Day 2 with a 15-12 win over Yan Wai Liu (HKG), 15-12. “I got cut last time, so it means a lot to see how far I’ve come,” Zhang said. Rhodes and Lam, the youngest members of Team USA at 15 years old, are each competing at their first senior international event and Lam fencing at her first FIE event at the junior of senior level. Rhodes started her day going 4-2 in pools and outtouched 2015 Cadet World bronze medalist Victoria Yusova (RUS), 15-14, in the preliminary table of 64. “I just told myself to not be nervous because it doesn’t help and I tried to not rush and tried to set up all my actions,” Rhodes said. After going 4-2 in pools, Lam faced 2018 World Team Champion Margaret Lu (Greenwich, Conn.), taking the bout, 15-7. Competition will continue on Sunday with the top 64 men and women competing and the gold medalists being crowned on Sunday night. Race Imboden (Brooklyn, N.Y.) enters the men’s tournament as the World No. 1 and reigning champion with Kiefer seeking to improve on her bronze medal at this event last year. All bouts will be streamed live at www.youtube.com/fievideo.